Can juggle lives, but the ball drops every now and then. Sharp IPS screen; Good sound quality. Underwhelming camera; Not ideal for single-handed usage; Disappointing battery life; Limited storage. The biggest domestic smartphone player, Micromax's flagship phone has hit the market. Dubbed Canvas Turbo A250, it's the Indian brand's first full-HD phone. Moreover, there's a 13 megapixel camera to boot. 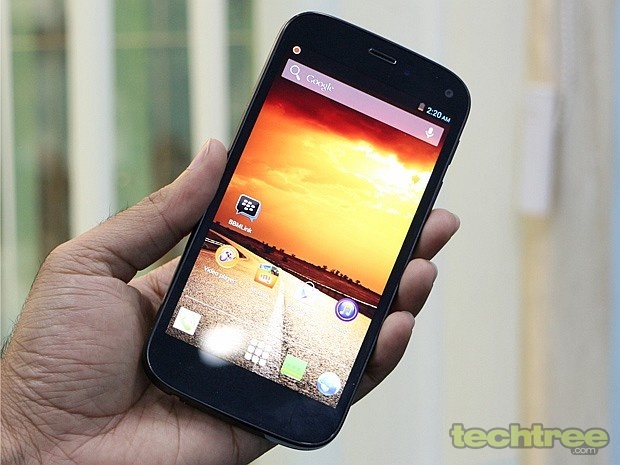 With this release, can Micromax finally manage to present itself as a premium phone-maker? - Those who want a full-HD screen on budget. - Those looking for good music quality. - People who are bothered about the spec-sheet on paper. - Those who can't compromise on build quality. - Those in for a phone with long battery life. - Folks who love photography. - Those who like to carry their entire music collection with them. Going by the looks, the Canvas Turbo is more inclined towards Doodle 2 rather than its predecessor Canvas 4. The phone's back is made of aluminium, which wins it the title of poor man's HTC One. From front, the phone looks like a typical Samsung GALAXY handset. It features an edge-to-edge glass, curved edges, and glossy sides. Although it's not a unibody design, the battery is non-user replaceable. And since the back-panel cannot be opened, both the SIM-slots have been placed on the left-side of the phone. The phone features three capacitive navigation keys that are only visible when the phone has been unlocked. The Lock/Power button is placed on the right side. The Volume Rocker is right besides that. Strangely, the 3.5 mm jack is at the bottom, while the micro-USB port sits on top. The Canvas features a 5" IPS screen with pixel dimensions of 1920x1080. At around 440 pixels-per-inch, the screen is impressively sharp. Being an IPS panel, the colour reproduction is quite good, except for white, which looks slightly yellowish on this screen. Moreover, the display is not as vibrant as found on some of the similarly priced phones from XOLO and Gionee. The Canvas Turbo is powered by a quad-core MTK 6589T chipset clocked at 1.5 GHz. It has 2 GB of RAM and PowerVR SGX544 GPU for gaming. Other features include Wi-Fi, 3G, Bluetooth 4.0, A-GPS, and 2000 mAh battery. The phone has 16 GB internal storage, of which around 12 GB is user accessible. The phone lacks a microSD card slot for further expansion of storage. 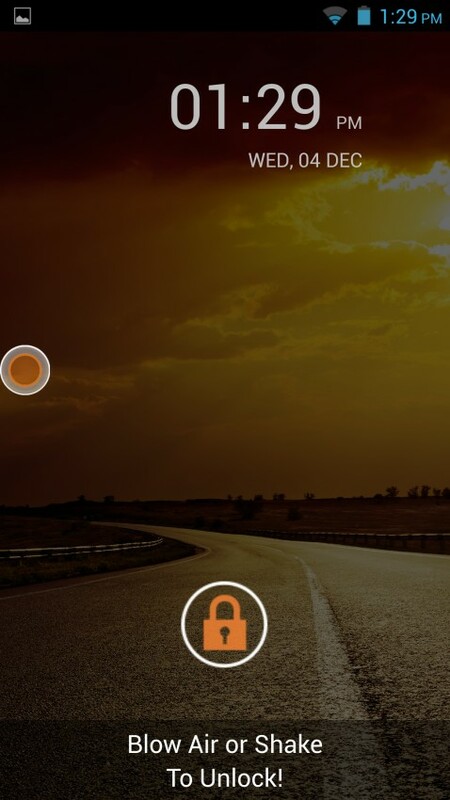 The Canvas Turbo ships with Android 4.2.1 (Jelly Bean). Micromax hasn't made many changes to the stock Android ROM, save for badly done icons and a few pre-installed apps. One UI element worth noting is the iFloat Tray. It's a small circle that provides quick access to media player, messaging, browser etc. In short, it's a cheap imitation of Assistive Touch feature of the iPhone. I said cheap because unlike Apple's app, the iFloat is a lag-fest. Thankfully, there's an option to disable it, so I'm not complaining much. As usual, Micromax has nicked a few features from Samsung's kitty. For starters, you get a video pinning feature that lets you play videos in a windowed mode. There's a 'Pop Up browser' that lets you adjust the size of your browser window. 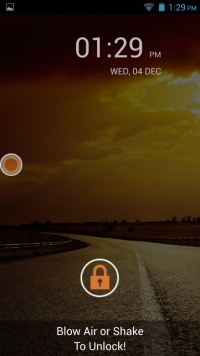 Micromax has also given its "creative" touches to the lockscreen. The phone supports 'Blow To Unlock' feature, which requires you to blow air near the mic to unlock the phone. 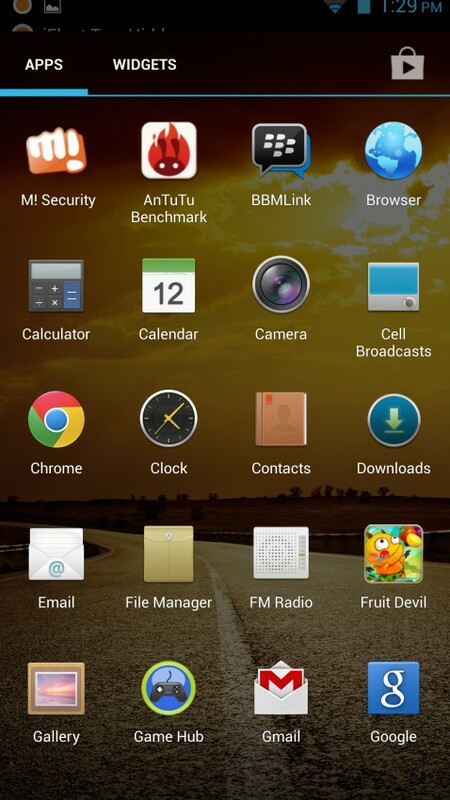 The phone comes pre-installed with a few apps such as File Manager, Opera Mini, Foneclay, Hike, and Spuul. 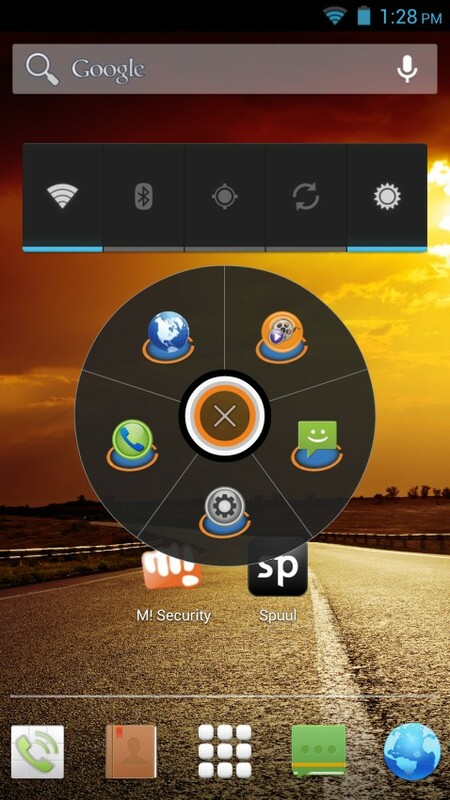 Moreover, you also get Micromax's exclusive services such as M! Live, Music Hub, Game Hub, and M! Security. The phone comes with a 13 megapixel auto-focus camera with an LED flash. That sounds quite impressive on paper, but the details offered by the camera are nothing to write home about. Not just the visual noise, but the camera also introduces weird purple artefacts to the photographs. The low-light performance is even worse. The only saving grace here is that the images come out quite well in broad-daylight. The Canvas 4 records full-HD videos in MP4 format. Similar to the still photography performance, the quality of video recording suffers indoors. The phone provides quite a smooth user-experience. However, it does lag a bit while rendering the transition effects. I guess this due to the full-HD screen taxing MediaTek's processor. If you're into casual gaming, the Canvas Turbo has you covered. However, those who enjoy playing high-end titles need to look somewhere else (maybe XOLO Play T1000). We ran a couple of famous benchmarks on the phone. Here are the results - AnTuTu: 15,534; Quadrant: 4753. In terms of video playback, the default player does a great job at handling popular video formats including MP4, DivX, and MKV formats without a hitch. It comes with MXPlayer’s swipe controls — seek the video by swiping horizontally and Swipe vertically to control volume. However, the 'Smart Pause' feature, which has been borrowed from the GALAXY S4, doesn't work most of the time. There were multiple instances where the player didn't pause when I looked away (in proper lighting conditions). For the Canvas Turbo, Micromax has designed its own music player interface, which is an attempt at mimicking Microsoft's Metro design language. Thankfully, the sound output of this phone is quite punchy. It's not very clean, but the tight bass will surely please you. Connectivity-wise, the Wi-Fi and Bluetooth radios are quite strong. Same can't be said about GPS though, as the Turbo couldn't put me on map without using network triangulation method. The phone comes with SIM management tool. Its network reception was great. The call quality was good too, but still not comparable to top-tier companies such as HTC, Nokia, and Samsung. In the messaging department, you get a standard Android keyboard, which gets the work done, but isn't as responsive as what you get on similarly priced WP8 devices. 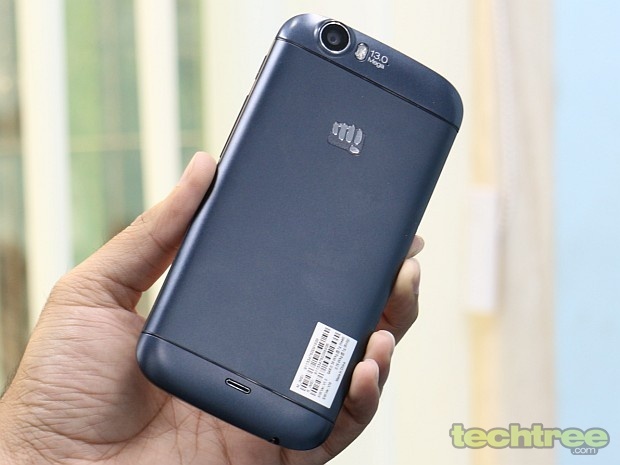 Micromax has thrown in a non-user-replaceable 2000 mAh battery in the Canvas Turbo. With normal use, it can last over a day. In our video loop test, it barely lasted for 4 hours 30 minutes. That's mediocre for a phone that costs around Rs 18,000. Apart from a full-HD (1080p) screen and 2 GB of RAM, the Canvas Turbo isn't really a major upgrade over its predecessor. In fact, the Canvas 4's camera performs better than that of the Turbo. Its battery performance suffers due to the power-hungry full-HD screen. Many Android fans will be put off by the limited storage, lack of microSD card slot, and non-removable battery. The build also lacks the finesse you'd expect at this price tag. So overall, if you're looking for a high-performance Android phone, we'd recommend the XOLO Play T1000 over this one. However, if you've decided to stick with Micromax, go for the Canvas 4 instead.